Fruit & Nut Case 70g - a fabulously fruity, oat and nut Granola Square. Packed with buttery oats, juicy sultanas, cranberries, nutty almonds, pumpkin and sunflower seeds and baked to perfection. Add a dash of sensational sweet, sweet honey and you have an energy boosting beauty bursting with all the good stuff. Gluten Free and Suitable for Vegetarians. 4 x Brilliant Brownie Square 70g - wonderfully chunky and luxuriously rich! Milk and dark Belgian chocolate mixed with a little magic these chocolate chip brownies are not only indulgent, but a piece of pure heaven! A Brownie that any girl guide would be proud of! Gluten Free. Suitable for Vegetarians. 2 x Lemon & Poppy Seed Muffins - Light & fluffy and oh so delicious, this giant muffin won't disappoint! 2 x Giant Double Choc Chunk Chip Cookie 90g - from the quirky Snak Shed, there's the bigger than most doubly delicious Double Choc Chunk Chip Cookie! With really chunky pieces of chocolate there's a double chocolate delight in every bite! Set out in a lovely little white Gift Box finished with sugarpoke ribbon. 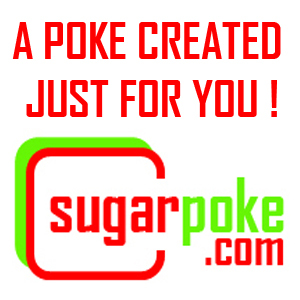 I have been using sugarpoke for years and yet to find anyone else who provides such quality gifts at such great prices. A great selection to suit everyone's budgets and fantastic service.